General Motors India is moving aggressively in Indian markets by launching back-to-back models. 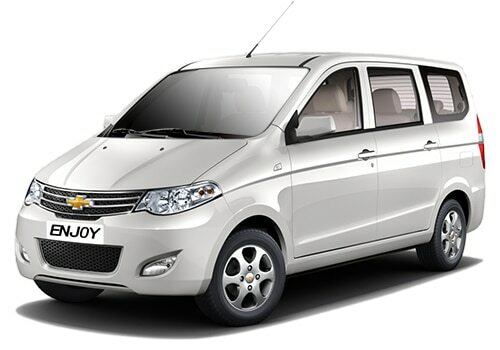 Just few months back, it has come up with its flagship hatchback Chevrolet Sail U VA after which it had introduced the flagship sedan Sail and now has introduced its first MPV, Chevrolet Enjoy. This is an MPV that comes with huge interior space that can offer enough space for at least 7 people. The company's moves, in the past few months, explain that the GM is not leaving any stone in the country's domestic market unturned. The all new Enjoy will be competing with the likes of Toyota Innova, Maruti Suzuki Ertiga, Nissan Evalia and few others. There are advantages as well as disadvantages associated with this new vehicle. 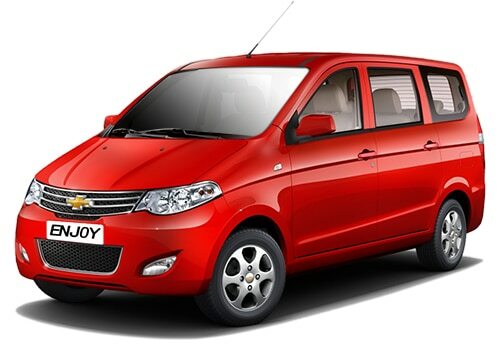 Launched in both petrol and diesel engine options, the new Chevrolet Enjoy price starts at just Rs. 5.49 lakhs, which is a very attractive price tag. There are overall three trim levels and about 8 variants available in this new model called LS, LT and LTZ (in both petrol and diesel). Here, the LS model comes with seven and eight seater option extending the total number of variants to eight. The base variant LS however, has not got much of the attractive features but comes with air conditioner, power steering, power windows and few other features. If we just look at the top end Chevrolet Enjoy features, it has got music player, anti lock braking system, central locking and many other top class features. The top end variant also comes with an alloy wheels whereas the base and mid range versions come with conventional wheels. The specifications of all the variants will remain to be the same except in terms of anti lock braking system. The petrol Enjoy comes with a 1.4 litres SMARTECH petrol engine with a displacement capacity of about 1399 cc that churns out 101.92 Bhp of power and makes 131Nm of torque. The diesel variant is blessed with a 1.3 litres SMARTECH 1248 cc engine that makes 75.98 Bhp of power at 4000 Rpm and 188 Nm of torque at 1750 Rpm. All the variants of Chevrolet Enjoy have been paired with 5-speed manual transmission gearbox. The not-so-impressive thing about this new vehicle is its outdated looks, which lacks trendy style and design. It comes with a boxy body design. However, the only thing you can cheer about is its attractive front fascia with chrome grille, decent headlight cluster design, body colored bumper with integrated air dam and fog lamps as you can see in the new Chevrolet Enjoy pictures. It is spacious and affordable MPV from Chevrolet Cars, which would be the right choice for everyone who looks to buy an MPV.